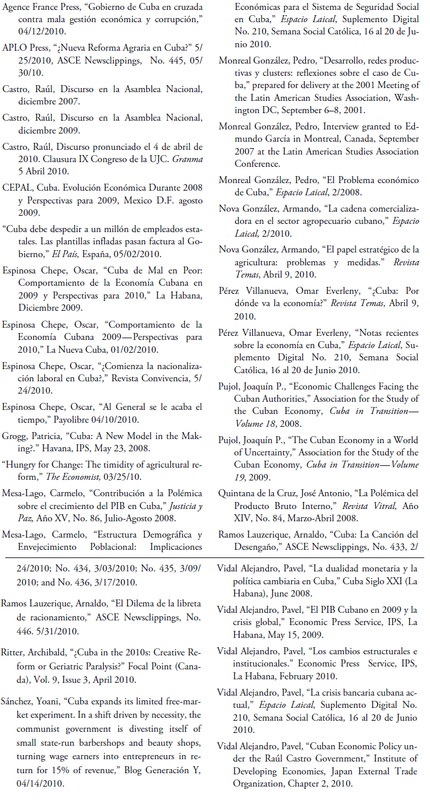 In this paper I will summarize how some Cuban economists within the island view recent economic developments and some of the policy measures that have been advanced to solve existing problems. I will not try to cover all the economists that have analyzed the Cuban economy in recent times but rather I will concentrate on a few, especially those who play the role of advisors to the government. In the past, the analyses prepared by these economists were not made public and access to their studies was reserved to the top members of the Cuban government, but recently their work has become more widely available. At this time, Cuba is facing a very significant challenge. The economy is facing a very difficult situation, and the time has come for the authorities to make drastic changes in their economic model if they expect to restore productivity and growth. Omar Everleny Pérez Villanueva is an economics professor at the University of La Habana and Senior Economist at the Center for the Study of the Cuban Economy (Centro de Estudios de la Economía Cubana, CEEC) in Havana. In recent articles published in Revista Temas and in Espacio Laical, Pérez Villanueva examines the performance of the Cuban economy in 2009 and the prospects for the immediate future. His diagnosis is not very optimistic. He points out that external factors— such as the world financial crisis, the hurricanes that ravaged the island in 2008, the rise in the cost of food imports, the drop in tourism revenue and in remittances from abroad, the rise in the price of oil, and the fall in the price of nickel—aggravated other negative domestic tendencies and brought about serious macroeconomic imbalances. These external shocks resulted in a drastic deterioration in the terms of exchange (a drop of about 38% in 2008). According to him, the economy had shown a high rate of growth in the period 2001–2008 as a result of the income generated by the export of professional services (especially of medical doctors), a recuperation of investment in construction and transportation, and a rise in energy production. The high official rate of growth (an average annual increase of around 6%) reflects the new methodology adopted by the authorities to calculate the gross domestic product.1 For 2009 the growth of the gross domestic product (GDP), on this basis, is estimated at 1.4%, and a similar or lower level is expected for 2010. The two main problems faced by the Cuban economy, points out Pérez Villanueva, are a sharp fall in the rate of growth of GDP and an acute and growing deficit in the balance of payments. These two developments get reflected in a very large financial deficit. Among the factors contributing to the worsening of the economic performance is the disproportionate dependence on the service sector (the service sector accounts for over 75% of Cuban GDP), which relies particularly on cooperation programs with other countries, such as Venezuela. Since these programs depend on events that are unpredictable, outside the control of the Cuba authorities, and could suffer drastic changes in the future, it would be prudent for Cuba to develop other mechanisms that could serve as a buffer. The worsening of the terms of trade is aggravated by a very high dependence on food imports due to an inadequate agricultural policy, and a high intensity of use of imported energy and intermediate inputs, due to the low levels of efficiency and productivity of the industrial and agricultural sectors. 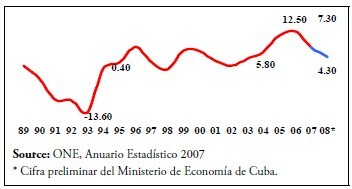 The Cuban authorities in recent times have recognized that significant structural reforms need to be undertaken in the agriculture and industrial sectors because of the lack of dynamism of exports, investments, and the growth of domestic production, which has resulted in very little diversification of exports and a heavy dependence on the export of services that have little impact on the domestic economy. Moreover, the state enterprises have experienced very low productivity. The above mentioned problems are aggravated by social factors, including a very low (and even negative) fertility. This has resulted in a situation where new births are not sufficient to ensure replacement in the labor force of a rapidly aging population. Moreover, many of the young people are leaving the island, thus resulting in a net decline in the active labor force. In the past, sugar and tourism where the two most important sources of domestic activity, with a significant multiplier impact on the rest of the domestic economy, but the sugar industry has practically disappeared, and tourism has stagnated in recent times. According to Pérez Villanueva, the economic growth model based on the export of professional services has significant weaknesses and is showing signs of exhaustion. This has resulted in a significant limitation in the availability of foreign exchange to pay for imports and finance investment projects, and has contributed to the deceleration of economic activity. As a consequence of these developments, the fiscal deficit, which had in recent years hovered about 4% of GDP rose to 6.7% in 2008. In order to reduce it, the government had to adopt a very sharp readjustment in its expenditure plans in 2009 through an average cut of 6% across the board in government expenditures. These expenditure cuts had to be further intensified during 2010. As a result the level of investment at the national level has declined and even more so in certain provinces. Housing construction and maintenance, in particular, has suffered from the lack of funding. Since 2001 there had been a sharp reduction in housing construction, and the hurricanes of 2008 further aggravated an already dismal situation. Looking at developments in specific sectors of the economy over the last few years, Pérez Villanueva points to positive results in the extraction of oil and gas and in an increase in the number of tourist arrivals. 4 However, the domestic productive sector has not shown any growth as a percentage of GDP, with the exception of construction. Even industries like nickel and sugar, where there is potential for growth, have not been able to take advantage of high international market prices due to an inability to increase production. Sugar production declined to the level of about one million tons per year since 2007, and in 2010 even that level might not be reached because of shortages of needed inputs, lack of incentives to producers and a process of decapitalization of the industry. In view of this difficult situation, a dilemma facing the authorities is how to reduce expenditures of state enterprises without affecting negatively employment and production. In other words, is it possible to control the expenditures of state enterprises while increasing their productivity and final output? Pérez Villanueva argues that Cuba must stop going from fighting a crisis to another crisis, with solutions thought up on the spur of the moment, and advance towards a development strategy that includes a wide range of simultaneous measures, from monetary policy to those directly related to industrial and agricultural production. He considers the steps taken so far as small and insufficient in relation to the nature and size of the problems faced. Much deeper structural reforms are needed, with emphasis on a decentralization of the decision making process, the establishment of conditions for non-state-owned properties—not only in the agricultural sector but also in manufacturing and service activities—which will allow the State to concentrate its resources in its regulatory function rather than to try to manage everything. According to him, a reform is needed that will clearly define the role of the market, the degree of State regulation, the allowable forms of property and the forms of entrepreneurial organization; on that basis the authorities will be able to adopt a strategy for the future economic development of the country. Pedro Monreal is Professor and Researcher at the Center for Research on the International Economy (CIEI) of the University of La Habana. For quite some time, Monreal has maintained that the development of the Cuban economy requires a radical change in the current model of development, which in his view is a variant of industrialization via export substitution. He has argued in favor of a strategy involving a “re-industrialization with export substitution,” which would involve a substitution of exports that are based on intensive reliance on natural resources by exports that are technologically intensive. He argues that the availability of a highly educated labor force in Cuba could make this feasible. In an article published in Espacio Laical, Monreal distinguishes between “structural reforms” and “economic reforms.” The first involve complex transformations that modify the organization and functioning of the economy, including its international specialization and require time to be implemented. The second are more limited in scope and operate within the existing framework. While an economic reform may take some time to implement and for its results to be seen, it has a limited scope and can take place within the existing economic framework. His view is that in Cuba’s current circumstances, both types of actions are needed. In the case of the agricultural sector he points out that there is a very sharp contrast between the inability of the country to produce enough food for domestic consumption—in the quantities and at the prices that would be needed to meet domestic demand—and the availability of land suitable for agriculture and a large enough labor force to be able to work the land productively. In Monreal’s view, three fundamental structural reforms are required to bring about the revitalization of the Cuban economy: (1) the introduction of pricing mechanisms that would allow a proper calculation of the costs and rates of returns of economic activities, so as to have an impact on the economic processes; (2) the adoption of appropriate incentives to motivate individuals and enterprises to conduct economic activities; and (3) the establishment of mechanisms that will encourage innovation, in its widest sense, so as to transform the existing disequilibrium into new opportunities that bring solutions to the existing problems. To help bring this about in the agricultural sector there will have to be a complete change in the way in which farmers have access to ownership and use of the land and other inputs, and there has to be flexibility and decentralization in the decision making process and in the role that the market has in determining what is produced. With regard to specific economic reforms, Monreal sees a need for a number of measures, including: monetary unification, modification of the exchange rate policy, changes to the way in which salaries are determined, reduction or elimination of subsidies, adoption of policies to encourage labor discipline, reorganization of administrative units to avoid duplication and excessive bureaucratic intervention, and so on. He sees the adoption of these measures as the first steps needed to implement the required structural reforms. In his view, the economic system in place today cannot serve as the basis for future sustained economic development. Pavel Vidal Alejandro is an economics professor at the University of La Habana and a Researcher at the CEEC. Vidal Alejandro in various articles has pointed out that while the Cuban economy has been affected by a number of external unfavorable developments in recent times, there has been a tendency for growth to slow down conditioned by a number of domestic structural problems. In particular, the growth experienced by the economy between 2004 and 2006 was accompanied by an expansion of exports and investment, the latter reaching some 20% of GDP. In contrast, in 2007–2008 the rate of expansion of exports and investments declined, contributing to the deceleration of the growth of the economy. Some of the factors underlying this loss of dynamism include: stagnation of the agriculture and industrial sectors, lack of diversity of exports, low multiplier impact of the export of services, and low productivity of the majority of state enterprises. The existence of a small domestic market, dependent on imports, also contributed to the slowdown. In general, the model of development based on the export of professional services has shown significant structural weaknesses and signs of reaching a plateau, which has been reflected in greater limitations in the availability of foreign exchange to finance investments and more generally in a tendency for the deceleration of the growth of economic activity. The international financial crisis hit Cuba at a time when it was experiencing a weak macroeconomic situation as a result of previous disequilibria related to the deterioration of the terms of trade and the damage generated by the hurricanes that hit the island. The fiscal deficit as a proportion of GDP had doubled in 2008 and the money supply increased by 40%. This resulted in inflationary pressures that led the government to establish price controls in the agricultural markets. But this in turn had a negative impact on production and required an increase in food imports. As a consequence of the resulting balance of payments disequilibrium, the external debt rose by 11% in 2008 and the lack of foreign exchange led Cuba to postpone external payments due to foreign creditors, incurring external payments arrears. The situation got even worse in 2009 and early 2010. While remittances and tourist arrival improved somewhat as a result of the relaxation of controls on these items by the U.S. government, receipts from tourism fell in dollar terms, while exports receipts from nickel exports and even tobacco suffered from the negative price developments in international markets. The large and persistent deficits in the balance of payments in 2008, 2009 and the first half of 2010 have generated substantial foreign exchange shortages. As a consequence of the combination of an increase in imports, a deceleration of exports, greater obligations to service a growing external debt, and a lower availability of external financing, the demand for foreign exchange could not be met. Moreover, these external pressures, given Cuba’s fixed exchange rate, have ended up affecting the functioning of the banking system. The lack of foreign exchange led to substantial delays in making payments abroad for imports and other obligations, and created pressures on the domestic balances of the commercial banks. In response, the authorities took steps to lower travel expenses, suspend some imports, postpone investments, reduce other budgetary expenditures, and limit the ability to withdraw funds in cash from the bank accounts by foreign enterprises and individuals operating in Cuba. From 1961 to the 1980s there was only one bank in Cuba, the Banco Nacional de Cuba. This bank concentrated all the functions of central bank, commercial and investment banks, as well as being in charge of all international financial operations. In the 1990s the system experienced a drastic transformation: the Banco Central de Cuba was created and put in charge of monetary policy, overseeing the payments system, and supervising and controlling the operations of 8 commercial banks and the rest of the financial institutions, both domestic and foreign. This made possible a modernization of the banking system and better integration with international markets. However, since 2008 the financial situation of the island has deteriorated substantially. Already in mid- 2008, Cuba was unable to meet certain payments due to Japan, Germany, Canada and France. This situation worsened in 2009 and resulted in a banking crisis when Cuban banks were unable to meet payments abroad on a timely basis. Transfers that previously would take days were delayed months; it is estimated that frozen funds reached as high as one billion dollars. This crisis has not so far affected domestic transactions in as much as there have not been massive withdrawals of domestic deposits from the banks. Instead it has been related to the transactions in “convertible Cuban pesos (CUC),” as the accounts denominated in that currency have lost their coverage in foreign exchange at the Banco Central and the commercial banks have not been able to honor payments in foreign exchange related to these accounts.7 An excess in the issuance of CUC beyond the liquidity provided by the holdings of foreign exchange held by the Banco Central has created problems for the functioning of the system of payments, particularly for payments abroad. Originally, the CUCs had convertibility in that the holder of CUCs could buy U.S. dollars or other foreign currencies for his or her commercial or financial transactions; this could not be done with Cuban ordinary pesos.8 The way the system currently operates is that individual Ministries distribute to state enterprises under their supervision the amount of foreign exchange that has been allocated by the Banco Central form the Single Account of State Foreign Exchange. For that purpose the Banco Central issues Liquidity Certificates (CL) which makes it possible for certain “convertible Cuban pesos” to be truly convertible into foreign exchange. Those bank account backed by CLs can make payments abroad; the others are not really convertible and can only be used for domestic payments. The accounts denominated in “convertible Cuban pesos” are not the only ones that have had convertibility problems. Accounts owned by foreign and mixed enterprises operating in Cuba denominated in U.S. dollars, Euros and other currencies have been frozen. Vidal Alejandro feels that one factor that has contributed to the current banking crisis is the maintenance of a fixed exchange rate policy with a fixed exchange rate that is not representative of market conditions. To maintain the fixed exchange rate on the face of growing external imbalances, the Banco Central had to cover with its international reserves the deficit in the supply for foreign exchange. This intervention by the Banco Central resulted in the loss of the country’s international reserves and reduced the liquidity that the Banco Central needed in order to back up the “convertible Cuban peso” and to act as lender of last resort to help meet the banking system’s liquidity crisis. A flexible exchange rate more closely related to balance of payments conditions would be a potential policy instrument to help face the current crisis. 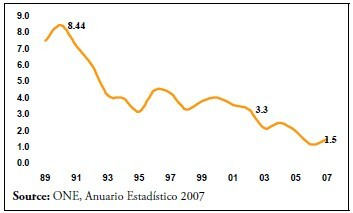 A timely and gradual devaluation not only would have helped to minimize the impact of the deterioration of external sector accounts but would also have gradually reduced the excessive real valuation of the “convertible Cuban pesos” in circulation, thus helping to eliminate some of the pressures on the foreign exchange market and on the convertibility of the CUC by reducing the purchasing power of the bank accounts denominated in “convertible Cuban pesos” in terms of U.S. dollars and other foreign currencies. Such a policy would encourage tourism and import substitution and could make it easier to eventually eliminate the dual exchange system. The difficulties experienced by the Cuban banking system have had all kinds of negative implications— both direct and indirect—for the functioning of the real economy, especially for the availability of credit and foreign investment and international trade transactions. The most obvious consequence is the unavailability of imported goods throughout the whole range of retail and wholesale domestic markets. Unifying the domestic monetary system would help eliminate many of the distortions now generated by the dual currency system, in particular with respect to salaries and their purchasing power, which is an important source of complaints by the population. It also could make the access to foreign exchange more closely related to the economic results of enterprises rather than to bureaucratic allocation. However, such a step would require the establishment of an exchange rate for the Cuban currency in equilibrium with market conditions. In Vidal Alejandro’s view, to resolve the current impasse there has to be a return to the policies of liberalizing and decentralizing economic decision-making along the lines that were adopted in the 1990s. Clearly, the Cuban economy also needs a significant reduction in public sector expenditures to generate the financial surplus needed to return the economy to equilibrium. Without such an adjustment it would not be possible to restore equilibrium and to re-establish the financial credibility of the country. Vidal Alejandro believes that the actions taken by the government since 2009 are in the right direction: during that year there was a 37% cutback in imports and a surplus was achieved in external trade of goods and services; the budget deficit was reduced from 6.1% of GDP to 4.8% through a tightening of expenditures. For 2010 the target is to reduce the fiscal deficit to 3.5% of GDP. This adjustment is being carried out without recurring to price adjustments, such as might be involved in devaluation. Instead it involves a 16% reduction in investment, a very harsh policy of energy conservation, greater control and supervision of budget expenditures, a reorganization and consolidation of functions and institutional structures, and the beginning of a program of elimination of gratuities and subsidies. As a result of the adoption of these measures, already in the second half of 2009 Cuba began to restore some foreign payments that had been frozen or delayed, but only for those suppliers that agreed to continue their shipments to Cuba. More recently the Cuban banks have offered the owners of the bank account that have been frozen to release them over a five year period in monthly disbursements, paying them 2% interest but without any guarantees or collaterals. Since Raúl Castro took over the direction of the Cuban government, Vidal Alejandro points out, some important structural and institutional reforms have begun. While these changes do not cover all the needed transformations and do not involve a substantial modification of the Cuban economic model, they merit to be pointed out. The main structural changes have been: a liberalization of certain types of individual consumption and the turning over of land to private individuals. Concerning consumption, the government lifted the prohibition for Cubans to have access and to stay at hotels that previously were restricted to foreign tourists and they have also been allowed to own cellular phones. Moreover, the State stores began to sell to individuals some articles previously not allowed to be imported or sold within Cuba, such as: computers, DVD readers, motor bicycles and some electro domestic appliances. The expectation was that the development of the domestic market would generate incentives for foreign and domestic investments in areas designed to benefit individual consumers and to reduce the inequalities that had arisen between consumers that had access to foreign currencies through their work or remittances and those that did not. These measures were expected to have a positive impact on the fiscal revenues of the government and the state enterprises, and prevent the accumulation of idle funds that increase monetary liquidity, as had happened in the 1990s. One criticism that can be made to the government’s economic policy is that it has been very slow in implementing some of the measures to incentivize new income. While some steps have been taken in agriculture and in the labor market, and some partial liberalization experiments have been undertaken in some regions of the country, the overall rate and extent of implementation could be improved. CEPAL has pointed out that while this change in land policy may bring about some short term positive results, in the medium to long term there are structural conditions that are likely to limit its impact. First, over the years there has been a large migration towards the cities and only 25% of the total population is rural; moreover, the rural population is older than the urban one, so that production techniques that are labor intensive are less viable. Second, the state has limited resources available to invest and apply methods of production that are capital intensive, while the private sector is not getting plots of land large enough or for a sufficiently long period of time to take advantage of modern high tech (and capital intensive technologies). Also, there are few sources of financing available. One element that conspires against a significant increase in agricultural production is the continued state control over the commercialization of output and of the inputs needed for production. Farmers are obliged to sell up to 70% of their crop to a state enterprise, Acopio, which is in charge of the collection and distribution of output. While in the last two years the prices paid by Acopio for products such as milk and meat have been increased, in general Acopio pays excessively low prices for the products it procures and their distribution system has been very inefficient, resulting in large losses of perishable agricultural products. Vidal Alejandro argues that economic policies being undertaken by Raúl Castro have been effective in helping control expenditures, an important step to restore credibility and financial stability. Nevertheless the measures to increase income and productivity have been few and not sufficient, and he questions the fixed exchange rate policy. Without a lender of last resort, viable alternatives to a devaluation of the currency are not evident and there is a high probability for the Cuban economy to remain submerged in a stagnation or recession period for quite some time. Vidal Alejandro feels that a true opening to foreign investment, offering facilities that would overcome some of the financial risks now present, could help attract new capital and help energize the economy even in the absence of foreign credits. The risk that the Cuban economy could tailspin into stagnation or even into a deep recession is present, and prevention of that risk will depend on the speed and efficacy of the transformations that are needed to stimulate higher productivity. Armando Nova González is a professor in the Economics Department and researcher at the CEEC, University of La Habana. A specialist in agricultural economics with a doctoral degree in economics from the University of La Habana, Professor Nova has held posts in the Citrus Group of the Ministry of Agriculture and the Central Planning Board. In an article in Revista Temas, Nova discusses the importance of the agricultural sector in the Cuban economy and makes a number of comments and suggestions in regards to the policies adopted by the government, particularly reductions in the number of institutions involved in supervising agricultural production and simplification of their activities. Nova suggests that it would be desirable to go even further, arguing in favor of having a single ministry supervising the entire agricultural sector and decentralizing even more the decision making process, separating the oversight role of the government from the role as producer. Currently, the ministerial structures reach down all the way into production activities at the local level and there are few bilateral horizontal relations between producers and with distribution agents within each territory. Nova favors a different structure of organization, whereby local associations would be created with representation from the different units of production and distribution to coordinate activities in their areas. These associations could help resolve economic, technical, productive, and financial problems that arise at the local level without having to wait for decisions and actions from the highest governmental levels. He suggests also liberalizing the markets for production inputs, including the sale of tools and equipment and the provision of services. With respect to the leasing of land under usufruct, Nova feels that the recent law still leaves a certain level of uncertainty that tends to discourage muchneeded long term investment and farmers without the sense of ownership that would lead them to plan for the most efficient use of the land. It would be important, he posits, to clearly define the juridical status of the properties, so that farmers can have the right to make decisions as to how to use the land and be responsible for results obtained. This concept should go beyond having a title to the property—it also should involve the individuals in being able to make all relevant decisions with respect to the use of land (what to produce, how to produce, which inputs to use and how to obtain them, to whom to sell the output and at what price) without government micromanagement. Making the land available to producers is a necessary but not sufficient condition for successful agricultural enterprises. The role of the State should be that of a regulator—seeking to balance supply and demand and the interests of producers and consumers. Nova agrees with Pérez Villanueva and other academics that, among other things, “productive forces need to be freed up,” with clear rules on how they can operate. The market needs to expand to provide incentives for production and work, and excessive centralization and restrictions on businesses— whether financial or production-related—should be eliminated. There needs to be recognition that the domestic market is a real and concrete tool that drives development. Current barriers, like the lack of direct access of producers to the marketplace (for example with regard to milk, dairy products, meat, rice, citrus, etc.) have to be eliminated and the operations of the Acopio have to be scaled back to the barest minimum so that producers can sell most of their products directly in a marketplace characterized by free supply and demand. Only by doing this will appropriate incentives to production be able to work their way through. Of course, he states, the market cannot be left totally to its own devices and should be regulated so that the plan and the market are compatible. One of the measures being implemented that exemplifies positive changes in agriculture is, in fact, the establishment of shops where small farmers can buy directly what they need to work their land, instead of having to rely on the centralized distribution system that has been in place. Finally, Nova believes that foreign investment could play an important role in certain segments of the agricultural sector, bringing in new technology and financing that would contribute to the recovery of food production for the domestic market and generate new sources of exports. Boris Moreno holds a Masters Degree in Business Economics. He is a priest and writes in the non-governmental magazine Palabra Nueva, edited by the Archdiocese of La Habana. In an article published in Palabra Nueva, Moreno portrays a pessimistic outlook for the Cuban economy. In his view, the Cuban economic situation has become extremely complicated and there is the possibility that it may experience a drastic fall along the lines of what was experienced in 1990–1994. He indicates that the authorities have been unable to improve the domestic economic situation since 1989, a year that was already not very good in economic terms. Government policies have lacked a proper perspective and have instead focused on an ideological effort to re-centralize economic decision making. In the current severe global crisis, the government’s only response seems to be to adjust by cutting the level of expenditures and making utopic statements that ignore the real economic situation. The economic strategy of the last few years has been based on the development of tourism, nickel and export of services, while taxing heavily imports since imports cannot be financed with receipts from exports. Tourism receipts have fallen recently, despite an increase in the number of tourist thanks to family visits by exiled Cubans (mostly from the U.S. as a result of the relaxation of travel controls to Cuban- Americans by the U.S. Administration), receipts from nickel exports have dropped due to the fall in international prices and a decline in domestic production, and receipts from services have tended to stagnate. Meanwhile, an effort has been made to increase domestic food production so as to substitute for imports, with little success. The rise in remittances, especially since the lifting of restrictions by the U.S., has become one of the two major sources of foreign exchange, and has helped prevent an economic collapse but they are likely to be adversely affected by the global financial crisis, while foreign investment has tended to decline. Expenditures on imported energy have continued to represent a heavy burden, despite the subsidies from Venezuela and the efforts to curtail domestic consumption. These developments have given rise to a crisis on the external position of the country: a sharp rise in the outstanding external debt, an inability to meet payments falling due, the termination of credit lines, the suspension of certain exports to Cuba, and the shut down of a number of mixed enterprises. The impact of these developments can be seen in the shortages of numerous imported consumer goods and of raw materials for domestic manufacturers. Cuba cannot palliate this negative situation by recourse to international financial institutions (like the World Bank, the Inter-American Development Bank, the IMF, and other international organizations), as other countries have done during the global financial crisis, because Cuba is not a member of these organizations. On the domestic front, the government has announced a change in the wage policy to take into account differences in productivity, but this policy is not being applied in reality throughout the country or to the entire labor force. To this must be added that the liquidity in the hands of the population has been increasing sharply and this, together with shortages of goods, is having an inflationary impact. The government has attempted to mitigate this situation by cutting expenditures, but this has been done in a manner that is affecting production. There is a growing risk that the continuous fall in real wages could bring about social unrest. Finally, from a psychological point of view, expectations were raised when Raúl Castro took over that there would be important changes in economic policies, as Raúl himself indicated in his July 26, 2008 speech. Almost three years have gone by and the economy today is in worse condition, and the measures taken have been few and of little consequence, raising the risk of a breakdown in the already-fragile social cohesion. Just a call to work harder will not do—socio-economic conditions do not change just because a speech is made or a law is passed. Decisions have to be implemented to change the overall economic organization and institutional framework to bring about a change in the economic environment and encourage entrepreneurial activities. Significant reform measures would need to be implemented, some of which might not require fundamental changes in the institutional set up. Among them are measures that would allow and promote self-employment activities (actividades por cuenta propia), independent from the state. A legal framework should be approved that allows these activities to take place without the fear of prosecution and that reduces the uncertainty that now prevails concerning their legality. Another measure would be the authorization for small and medium-size enterprises to operate, including in retail commercial activities (this is especially important with respect to agricultural products). A third measure would be the prompt implementation of a wage policy that would allow and encourage enterprises to set their own salary scales in relation to productivity. It would be desirable to change the emphasis of external sector policies from import substitution to export promotion. This may require allowing the operations of international banks and a unification of the exchange rate policy. There would have to be a reform of the institutional set up for enterprises, allowing other enterprises to operate alongside state enterprises and having the Ministries become instruments of orientation and regulation rather than direct productive operations. Arnaldo Ramos Lauzerique is an independent economist, Deputy Director of the Instituto Cubano de Economistas Independientes, a non-governmental civil society organization. Ramos Lauzerique was imprisoned during the Black Spring of 2003 for his criticisms of government policies; Amnesty International has recognized him as a “prisoner of conscience.” His writings have been smuggled out of the Prison Nieves Morejón in the province of Santi Spíritus, where he is currently serving an 18–year sentence. According to Ramos Lauzerique if one had to identify the four horsemen of the Apocalypses in Cuba, they would be: violation of human rights, deficient food production, transportation problems, and the lack of adequate housing. Ramos Lauzerique questions the reliability of government statistics. In particular, he examines the structure of the GDP in recent years and argues that the numbers do not match up to the realities. He points out that according to the government GDP rose by 1.4% in 2008, but that given that in the first half of the year it only rose by 0.85%, it would have had increase by 2% in the second half of the year, a time when agricultural production was weaker, and moreover when there were deep reductions in imports and in electricity consumption. In 2009, the government claims that there were increases in the production of tubers (potatoes and sweet potatoes), eggs, rice, beans and citrus, while recognizing declines in coffee, bananas and corn (Juventud Rebelde, 17/12/09 and Granma, 21/12/09). The government has not reported statistics on meat production, where there was a decline (in the case of pork, only 93,000 tons were produced, way below the 148,000 tons produced in 2008). Despite these announced increases in food production, little increase in supply was seen in the actual marketplace and there were substantial complaints about the distribution system in Havana. The agricultural markets in the city of Havana received in January 2010 only 60% of the expected deliveries of foodstuffs, and in February 2010, 64%. Among the reasons given for the shortfall in supplies were the lack of fertilizers and other inputs in the later part of 2009 and inefficiencies in the distribution system that resulted in great losses of perishable produce. Industrial activity has not performed any better. The sugar industry suffered a decline in output of about 14 % in 2009 with respect to 2008, and production is unlikely to reach 1 million tons in 2010. Nickel production was adversely affected in two ways: (1) the hurricanes temporarily paralyzed three of the factories; and (2) prices in international markets dropped so low that at one point stopping production altogether was being considered as production cost exceeded the market price. As a result, nickel production dropped by over 10% in 2009. With respect to the transportation sector, Ramos Lauzerique points out the poor conditions of the road infrastructure that would require 18–19 million tons of asphalt for repairs and maintenance, when only about one million tons are currently produced. The government has announced an effort to improve the urban transportation system in Havana, where recently the government claims about 1 million passengers are being transported per day, compared to 530,000 in 2007, but still very far below the 3.5 million passengers that were transported in 1988. The improvements in Havana are not representative of what is happening in the rest of the country, where public transportation is practically unavailable in many places and the population has to depend on whatever private illegal transportation is available.11 He points out that Minister of Transportation Luis Serra has declared that 94% of the railroad track beds are deteriorated, 49% of the wagons are in need of repairs, and half of the locomotives are in dire condition. Only 259 wagons are available for local railroad transportation, of which only 64% are operational; 212 wagons are available for long distance rail transportation, of which only 28% are currently in operation, according to the official newspaper Granma (27/12/08). The hurricanes that hit the island in 2008 are estimated to have damaged or destroyed some 650,000 houses and caused some 84,700 buildings to collapse. Since then, only about 36% have been rebuilt. In the capital city of Havana at the end of 2008 there were 695,913 housing units; of these, 21% were damaged by the hurricanes, almost 10% left in very bad shape. Initially the plan was to repair 6,997 housing units in 2009 but by the end of the year repairs on only 2,750 had been completed. With respect to new construction, fewer than 32,000 new housing units were completed in 2009, compared to a target of 50,000 and 44,775 completed in 2008. Even before the destruction caused by the hurricanes, it was estimated that there was a shortfall of some 500,000 housing units in Cuba. To the poor housing conditions one has to add the lack of hygiene, the poor quality of public lighting, the problems with the availability of water and electricity, the tense relations among neighbors due to the suspicion generated by the neighborhood committees and the “actos de repudio,” and the lack of entertainment facilities, particularly for young people. He points out that the decline in economic activity has affected the availability of all kinds of domestic services, and in particular of medical services. According to an official newspaper (Trabajadores, 05/ 01/09) Cuba has sent 72,416 medical doctors abroad, so that only 42,400 remain in the island. This represents a ratio of 265 inhabitants per medical doctor, a lower ratio than 10 years ago, and many of them are assigned to hospitals that only offer services to foreigners who are willing to pay in foreign exchange. Moreover, the quality of the training for doctors that remain in the island has declined. The decline in medical care has been reflected in an increase in diseases such as dengue fever, conjunctivitis and influenza A(H1N1), among others. Recently, 26 individuals died at Havana’s main Psychiatric Hospital (Mazorra) from dehydration and lack of care. Another sector that has suffered from neglect is education. The government has eliminated the system of scholarships for secondary and university students as well as the work-study program in the countryside because the cost was too high and the results lackluster. The government has also discontinued the program of using secondary school students to teach younger students because the results of the program were a total failure; instead, the approach has been to encourage retired teachers to return to work by allowing them to receive pay for these services in addition to their retirement pensions. The experiments the government is undertaking to try to increase production and resolve the economic crisis are an implicit admission of the failure of the economic model and of the disaster created by the poor management of state enterprises. The elimination of private property in the agricultural sector in the 1960s has resulted in a sharp decline of productivity and production; the government now pretends that small farmers will be able to resolve the problem without giving them the appropriate means to carry on their activities and without granting them ownership of the land or control over what they produce, to whom they sell it and at what price. Such a program is bound to fail. Raúl Castro is not an economist. But as the head of Cuban government he makes the ultimate decisions as to the economic policies the government will follow. He is not a man of many words, but he is a practical man, and he realizes that he is dealing with a serious economic crisis. Already in mid-2007, Raúl Castro, then interim president, announced that “structural and conceptual changes would have to be introduced as necessary” to boost crop yields and curb food imports, which were expected to absorb an estimated 1.9 billion dollars in 2008. His speech created expectations for changes in economic policies that have been very slow and few in coming and has created popular disappointment. In several occasions since then, Raúl Castro has expressed a willingness to tackle the problems in the agricultural sector, to eliminate monetary duality, to increase the very low wage level, to reinforce the institutionalization of the economic system, to eliminate subsidies, and to raise labor productivity, among other goals. According to CEEC studies, it is a sound move to begin with measures in agriculture because of the “multiplier effect” the sector has on the economy as a whole. Among the essential changes advocated by experts that advice Raúl Castro are decentralization of planning and creation of an environment that stimulates production. Without a solid economy that eliminates superfluous expenditures and waste, we will not be able to raise the standard of living of the population nor would we be able to maintain the levels of education and health care that we have offered our citizens. Without a strong and efficient agriculture, which we should achieve with the resources available to us, we cannot aspire to sustain and raise the output of agricultural products that could be produced in Cuba but which today we must import. Unless we get away from paternalistic and irrational state regulations, we shall not be able to stimulate people to work, nor will we be able to solve the chronic scarcity of qualified construction workers, farmers, teachers, policemen and other workers that are gradually disappearing from our society. Without a firm and systematic social rejection of corruption and illegal activities, a few will continue to enrich themselves at the expense of others. If we continue to maintain inflated payrolls in almost all types of activities, where the salaries paid have no relation to the productivity generated, and the currency in circulation continues to rise without any control, we can only expect for prices to continue to rise, reducing the real purchasing power of the population. We know that we have thousands of excess workers in our government and enterprises payrolls—the total exceeds one million workers—and this is something we must take care of. In summary, to continue to spend beyond our revenues simply means that we will be eating up our future and this will create tremendous risks for the survival of our revolution. Since Raúl took office, the government has taken some steps to “privatize” certain activities (such as barbershops and beauty parlors), give more autonomy to enterprises to adjust their salary scales to link them to their productive capacity and productivity, streamline certain Ministries and State enterprises, turn over state lands to private individuals and cooperatives, cut down expenditures on energy and other imported items and in general promote import substitution where feasible, extend the retirement age by five years, allow pensioners to go back to work without losing the right to their full pension, reduce the items included at a subsidized price under the ration cards, and eliminate subsidized lunches at workplaces. To deal with the global financial crisis, Raúl Castro’s government has exhorted citizens to consume less, save more and work harder. They have issued private farmers some of the idle state-controlled farmland and liberalized somewhat the use of private taxis. The Cuban government has also postponed payments to foreign suppliers and investors and has sought to have foreign enterprises operating in the island convert their deposits in Cuban banks into medium term loans. The government has reduced the goods made available under the subsidized rationing system (there is ongoing talk about the total elimination of the rationing card, but this has not materialized). Subsidized lunches at workplaces and government offices have been eliminated. Cubans have been allowed to buy portable telephones, computers and other electronic items, and to stay in the hotels previously reserved for foreign tourists.12 But the government has been hesitant to take bolder measures, such as the ones advanced by some of the economists mentioned above; for fear that the political situation may get out of control. The global recession hit Cuba hard, bringing into the open the inefficiencies that have been generated over a number of years. The intense foreign exchange shortage has made the need for reforms more urgent and this is recognized by those economists that advice the government as well as by Raúl Castro himself. But the implementation of the needed reforms has been cautious and modest. The dual monetary system continues to generate a behavior-warping incentive structure that deforms people’s work and lives. The internal blockade against small enterprises and private sector activities suppresses people’s initiative and entrepreneurship. Centralized controls continue to result in pervasive micro-economic absurdities as well as large scale fiascos. The general infrastructure and the housing structure continue to deteriorate due to lack of maintenance and of new investment. Overall domestic manufacturing production continues to decline. Cuba, once an agricultural exporter, has now to import 80% of the food it consumes, mainly from the United States. Cuba is extremely dependent on subsidies from Venezuela, not only for its oil needs but for investments in all kinds of activities. Worst of all, Cuba’s average inflation-adjusted real wage in 2008 stood at 24% of the 1989 level, according to analysts from CEEC, Cuba’s leading economic research institute, and this situation has further deteriorated since then. The most important source of Cuba’s economic problems is low productivity. But this should not be surprising given the very low wages paid to Cuban workers and the lack of appropriate incentives throughout the economy. Turning around the Cuban economy will require a marked change in the economic model applied in the island. To simply call for people to work harder will not do. There is need to allow private initiative to develop, not just in the agricultural sector but throughout the economy, and to limit government intervention to the bare minimum. It is interesting to note that the same Cubans that were unproductive in Cuba turn to be quite productive when they arrive to Miami—and are able to operate in a society where private initiative is encouraged and rewarded. 1. The national accounting methodology being used is unique to Cuba and differs from the one used in the rest of the world. Cuba has not published details of how its growth estimates are made. 2. The nominal wage increases have been more than offset by increases in prices. In 2009 real salaries were significantly below those prevailing in 1989. This has serious implications for the motivation and productivity of workers. Many young people prefer not to work for the government at all and instead try to obtain some outside sources of income. Under the Cuban system such “private” activities are considered illegal and can be subject to heavy fines or even imprisonment. 3. Cuba has two domestic currencies, “ordinary Cuban pesos” in which most salaries are paid, and “convertible pesos,” worth 25 ordinary Cuban pesos, in which certain goods are sold in government-owned stores. Such a system gives rise to all kinds of distortions and cross subsidies that would need to be eliminated to increase the productivity of the economy. 5. The external payments arrears heightened the reluctance by some foreign suppliers to export to Cuba and resulted in shortages in the domestic availability of many goods, including some crucial inputs for production. 6. However, the government still makes most decisions as to what is to be produced and controls the distribution of inputs required for production and the prices at which most products are sold. 7. A dual currency system was introduced in Cuba at the beginning of the decade of the 1990s, when the U.S. dollar was allowed to circulate and was accepted for payments alongside the ordinary Cuban peso. In 2003 the U.S. dollar was abandoned for deposits in accounts at domestic banks and for transactions between State enterprises, and in 2004 for use in state retail stores and savings accounts; it was replaced by the Cuban convertible peso (CUC). With the creation of the CUC, a dual system of payments was introduced for domestic transactions, where certain payments had to be made in CUCs and others in Cuban ordinary pesos. In particular, most salaries are paid in Cuban ordinary pesos, while most imported products are sold in CUCs, thus establishing a hidden tax/subsidy on cross transactions, and introducing all kinds of distortions in the relative values of various activities. When the CUCs were introduced in 1994 they had full backing, meaning that for each CUC issued, there was a U.S. dollar in deposit at the Central Bank; this is no longer the case. 8. A CUC could be obtained by exchanging for it 25 ordinary Cuban pesos. 9. It should be noted, however, that much of the idle land in Cuba is infested with marabú, a thorny wild bush that spreads easily and does not have any productive use. To be able to bring land covered with marabú into production, one has to start by clearing the land, a difficult and time consuming task. 10. In a recent speech Raúl Castro announced that Cuba needed to eliminate about one million redundant positions from the government employment. 11. Except in defined tourism activities, the Cuban government does not allow private transportation to operate and violators can be subject to substantial fines. 12. This measure was designed to counter accusations of inequality of treatment and discrimination against Cuban citizens, but also to boost occupancy of hotels as the number of foreign tourists declined.